After a brief stop in Indonesia to meet his numerous local fans at a Pull&Bear store in Jakarta, Marc Marquez headed to Malaysia to join his team at the Sepang International Circuit, which will play host to the third and final back-to-back flyaway race this Sunday. Having been innocently involved in a racing contact at the Australian Grand Prix and forced to withdraw, Marc will be back on track to try and seal the Constructors title that is within Honda’s reach, thanks to a 39-point advantage in the standings. With the Team Title also to defend, Dani Pedrosa is looking forward to racing at a track where he has been very successful in the past. As was the case for the Thai GP a few weeks ago, Marc and Dani will have to deal with the region’s typical extreme tropical weather conditions, with very hot temperatures and physically demanding sessions. Marc Marquez has 2 wins — 1×125 (2010), 1xMotoGP (2014) — plus 1 podium and 4 pole positions. 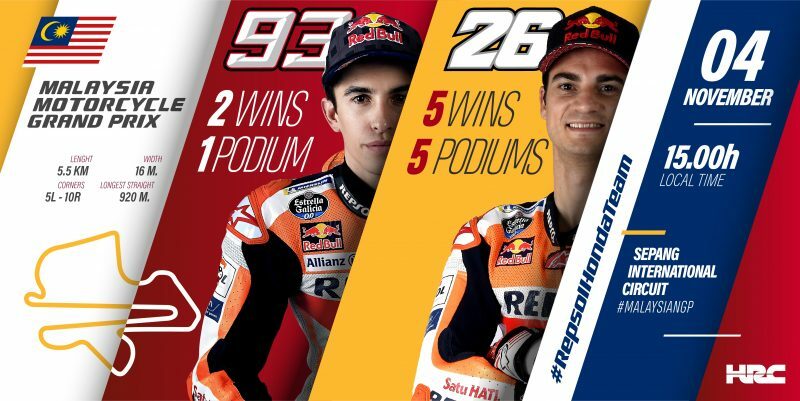 Dani Pedrosa has 5 wins — 1×125 (2003), 1×250 (2004), 3xMotoGP (2012, 2013, 2015) — plus an additional 5 podiums and 4 pole positions.